DR. ERNIE FERREL, M.A., D.C., C.C.S.P. Dr. Ferrel has been practicing chiropractic since 1987. He earned his bachelors degree from California State University at Chico in 1972, his masters degree from Kean College in 1981, and his doctor of chiropractic from Life Chiropractic College in 1986. Dr. Ferrel continued his education and completed advanced training in sports medicine to earn his Chiropractic Sports Physician certification in 1991. He has also obtained certifications as a USCF Sport-Elite Coach, an Industrial Disability Evaluator, a Graston Provider, and an American Red Cross First Responder. 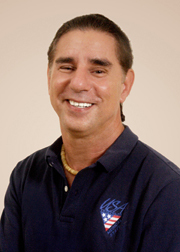 During his 21 years of practice, Dr. Ferrel has served as Medical Director for the Association of Volleyball Professionals, Director of Chiropractic Services for the Triathalon Federation, Board of Directors for the California Chiropractic Assocation, Vice President of the American Chiropractic Association Sports Council, and Steering Committee Member for the US Cycling & Triathlon Federations. Dr. Ferrel recently served as Team Physician for Beach Volleyball in the 2008 Olympics in Beijing, China. To see pictures of his trip, please visit our Photo Gallery on the front page!